Are you sick of fantasy and paranormal novels that sound like twenty books you've read before? Are you bored by YA novels that are entirely focused around romance? If so, Half Bad is the book for you. A high fantasy / paranormal that actually takes the genre to a different place. Nathan lives in a world split into three groups of people. White Witches, who are ostensibly good. Black Witches, who are supposedly evil. And non-witches, who are unimportant to the story. Nathan is a rare half-breed. His mother was a White Witch and his father a Black Witch. What's more, his father is the most infamous, evil black around. White Witches govern openly and are immensely powerful. Black Witches operate in secrecy and on their own. We soon realize that, in protection of "the good," the White Witches make the blackest Black Witch look kind. Their treatment of Nathan ranges from suspicion to outright torture - all in the name of protection for other witches. The White Witch "council" reminded me of Dolores Umbridge of the Harry Potter series. Umbridge (prior to Deathly Hallows) is on the "good" side, but her love for power and her methods to get what she wants are so cruel that she is more evil than most of the Death Eaters. The White Witches have a plan for Nathan, but he has plans of his own. First, to get away from the White Witches. Second, to get his Three Gifts, which are necessary for his survival and his emerging powers. Third, to know his father - to really know him, not just his name and reputation. For a book about witches, there is a distinct lack of magic. It's more of a typical hero's journey, of personal growth. The author emphasizes Nathan's story and personality over world-building and sometimes even plot. You'd think this would make the book confusing, but there's just enough information to allow you to follow the story. And there's no info dump to drag the plot down. The writing style sets this book apart and it exemplifies Nathan's personality perfectly. Nathan is a stand-offish character who, for good reason, trusts no one. He is not bookish, nor is he prone to fits of emotion. Similarly, the prose is spare, with short sentences and chapters. There are no flowerly words - words that Nathan would never use. The deceptively simple prose adds to the dark atmosphere of the book and keeps the pages turning quickly. Romance is an element of the plot. Nathan has been in love with Annalise, a White Witch from a prominent family since he was a child. His love for her factors into the plot and into his motivations, but is largely a subplot. It was refreshing to have a YA novel where romance was not the moving force behind the story. 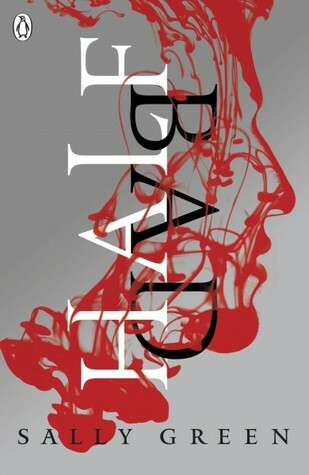 Half Bad is a great change from fantasies I've read lately. It's dark without being mopey. Well-written without being flowery. Fast moving but still character driven. A definite recommended read. I really like the sounds of this one. I enjoy a good fantasy novel and it having a romance that isn't the main plot is a big plus for me. Great review. I'm glad you enjoyed this one, too, Alison! So many bad reviews have been circulating for this book, but I really enjoyed it - and how different it was than the norm. This sounds so awesome. I think it's interesting how this book focuses more on the personal growth of Nathan, rather than the magic part, despite it being a book about witches. Definitely reading this soon. Great review! "For a book about witches, there is a distinct lack of magic." I like the beginning of your review, where you said this book would take you to a new place. So many novels are the same old thing these days. Refreshing to hear something's new and inventive. Thanks for sharing!! This sounds like an intriguing book. I like the idea of a book with witches but little magic. Besides that, the book was really good just very different from what I expected!